What should be the real issue of the 2008 presidential election is being lost in the noise of the Hillary Clinton-Barack Obama fracas. According to polls, three-fourths of Americans say the country is headed in the wrong direction. This is an astounding statistic. At other times and in other places, revolution would be in the air. But is there any indication that something truly substantial might change starting with the election of a new president eight months from now? Something that would take the U.S. in a radically new direction? Of course Obama has taken the word “change” as a mantra. Hillary Clinton still promotes herself as the candidate of “experience,” though after seeing her status as front-runner collapse in the face of Obama's string of primary victories after Super Tuesday, she has also recast herself as the one who will fight for the livelihoods of workers and the middle class. What often happens is that when faced with a problem, politicians immediately jump to solutions that would seem to garner votes without having conducted a thorough analysis of what the causes of the problem really are. The voters today know that much is wrong. The Democratic Party candidates say they can fix it. But let's focus a bit on what really might be the matter. The nightmare administration of President George W. Bush and Vice-President Richard Cheney began with the electoral coup of November-December 2000. Four factors, three involving the state of Florida, cost Democrat Al Gore the election despite a national plurality of popular votes. One was the simple fact of the archaic and anti-democratic institution of the Electoral College. The second was the disenfranchisement of substantial numbers of African-American voters by Florida election officials. The third was the presence on the ballot of third-party candidate Ralph Nader who siphoned off voters in Florida that might have supported Gore and given him the state's electoral votes without a recount. The fourth came when the Supreme Court blocked a recount and declared Bush the winner. Once Bush assumed power, two crimes on a historic scale ensued. One was the invasion of Iraq. Bush lied about the reasons the U.S. went to war, though it was obvious the invasion was a step in a pre-existing plan for military conquest of the Middle East. While the plan reflected the historic ambitions of the Anglo-American imperium, this latest phase stemmed from the epochal decision made during the Nixon/Kissinger years to tie America's fate irrevocably to control of Middle Eastern oil. The second crime was the housing bubble which was deliberately created by the financial industry, the Federal Reserve, and agencies of the U.S. government—certainly with White House approval—to float the U.S. economy following the stock market crash of 2000-2001. The political objective of the housing bubble was to buoy an economy whose productive capacity had been stripped since the time of the “Reagan Revolution” by export of American jobs, closure of factories, sale of U.S. companies to overseas investors, and deterioration of public infrastructure. How the bubble came about was simple. Once George W. Bush became president, Federal Reserve Chairman Alan Greenspan went to work through interest rate cuts that would encourage a huge inflation of housing costs. The federal government looked the other way as fraud became routine in enticing consumers to overspend their income. Also playing a part in getting consumer buy-in was the federal mortgage interest tax deduction. The windfalls from the inflation of home prices resulted only from borrowed money, not any productive enhancement of the economy. The largesse enriched financial institutions and the stock market and gave a temporary boost to consumer spending which propped up the economy for a few years. That bubble has burst, and a recession is hitting whose destructive effects are just starting. Housing values are plummeting with nothing to replace the ephemeral “wealth” now being lost by tens of millions of homeowners. Despite repeated Federal Reserve bailouts of the large financial institutions, the impact on the consumer economy is starting to be devastating. The Iraq War, whose multi-trillion dollar price tag threatens the federal government with bankruptcy, and the collapsing housing bubble, which threatens the rest of the economy with the same, are sufficient in their ramifications to delineate the current crisis. What, however, are the causes, and are Clinton and Obama identifying those causes? Hillary Clinton has pointed to U.S. dependence on Middle Eastern oil as a cause of the war and predatory lending as a cause of the housing crisis, and she is correct as far as she goes. She sees the cause of the recession primarily in the disappearance of decent jobs. Obama's diagnosis is similar, though he adds that it was a strategic error to invade Iraq while the real terrorists supposedly responsible for 9-11 are still loose in Afghanistan. He also advocates a substantial extension of the social safety net to protect Americans whose jobs are vulnerable and who are losing their homes to foreclosure. But neither Clinton nor Obama nor their respective armies of policy advisers have dug deep enough to get to the next layer of causality. And neither has addressed the philosophical issue of whether the solution is really a list of new government “programs” along with the elimination of the Bush tax cuts for the rich. So let's reflect on the possibility that maybe the George W. Bush presidency wasn't just an unpleasant accident from which the country needs to rebound but that it may reflect a deeper malaise that suggests the world's “only remaining superpower” has entered a steep decline. This malaise might be defined as the condition whereby the power of a great nation no longer works from the bottom up, through the character, work, and creativity of its people, but from the top down via: a) an increasingly all-powerful oligarchy of the rich; and b) bureaucracies that have so stifled people with taxes, laws, rules, and regulations that the average person can scarcely breathe without being written up, fined, investigated, spied on, or imprisoned. Life in these United States is increasingly becoming a purgatory where the average person pays almost half his or her income in federal, state, or local taxes; is swamped at his job or profession by government rules and paperwork, especially if he works in such fields as health care or education; has seen the costs of housing, gasoline, insurance, medical treatment, and now even food, skyrocket; must borrow huge amounts of money to educate his children, buy a home, or even pay for necessities like groceries; and where families must work at several jobs just to break even. And all this was before the recession with home foreclosures and more job loss picking up steam. But again, why is it happening and could either Clinton or Obama—or any president—do anything about it? The times are reminiscent of the run-up to the Great Depression, where buying of stocks on margin was rampant, there were real estate bubbles similar to the one today, and the financial oligarchy, holding onto power through its association with the Republican Party, was the dominant force in society. Today it's again the financial oligarchy which rules. During recent decades, particularly since the presidency of Ronald Reagan, it's been these oligarchs, presiding from a financial industry that was drastically deregulated, who have wrecked America's manufacturing economy, exported millions of our best jobs, and ruined small business and family farming by turning over huge segments of the economy to the globalist corporations they control, even as our own domestic economy continues to crumble. The oligarchs are in charge of the large oil companies and have influenced the mortgaging of our nation's foreign policy to a permanent alliance with the nation of Israel and to the monumentally destructive and expensive attempt to conquer the Middle East by force of arms. The oligarchs make fabulous sums of money through control of the military industrial complex, by encouraging war as the chief instrument of foreign policy, and by acting as the world's leading weapons developer and exporter. Meanwhile they dodge taxes and ignore their own financial responsibilities for the welfare of the nation while prevailing on the Bush administration to send the sons and daughters of the poor abroad to die for their profits. The oligarchs are in charge of the big banks. They act through the system of lending overseen by the Federal Reserve and control our lending-based monetary system which has plunged the nation into debt to the tune of almost fifty trillion dollars. It's been these same oligarchs who have abused the privilege of fractional reserve banking by creating such huge credit fiascos as the housing bubble, and by funding asset inflation and speculation through leveraging of equity, hedge, and derivative funds. The destructive nature of this speculation was shown in recent days by the insolvency of Carlyle Capital. J.P. Morgan and other huge banks created loans “out of thin air” to allow Carlyle to buy up businesses. Now that Carlyle has defaulted the banks have become the owners of these businesses. It's theft on a grand scale with the victims being the people who work for the companies which are the pawns in the financiers' game. Finally, since World War II it's been the oligarchs, acting through such institutions as the International Monetary Fund or through currency speculation, who have subverted the economies of a legion of other nations in order to generate profits for themselves. The rule of the oligarchs has relied on a string of weak presidents. Every president since John F. Kennedy, who was assassinated in 1963, has acquiesced in his own way. Johnson and Nixon appeased the investment bankers who were behind the military-industrial complex by waging the Vietnam War. Jimmy Carter was hand-picked by the Rockefeller-backed Trilateral Commission and began the deregulation of the financial industry which Reagan, Bush I, and Clinton carried forward. While Reagan was allowed to enjoy his movie star persona, he slashed taxes for the rich, ran up the largest federal deficits in history, and eliminated the government's regulatory restraints on business consolidation and monopoly. Clinton, the pro-business Democrat, signed on to NAFTA and gave the financiers free rein while keeping the federal budget under control through reducing the government payroll. Today, George W. Bush, while priding himself on his determination and toughness as a “war president,” has been a total nonentity in the face of the lobbyists, corporate magnates, and bankers who have completed their takeover of the economy in a manner reminiscent of the division of rackets among Mafia crime families. 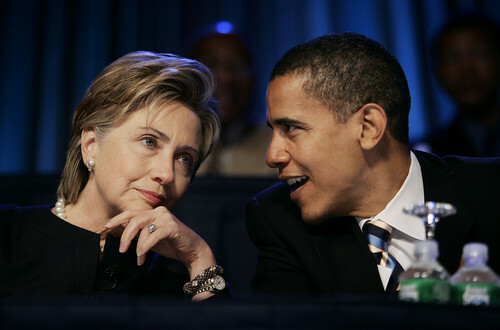 The question of whether anything can be done to avert the drift leaves us with the question of exactly where Hillary Clinton and Barack Obama now stand. Certainly the fact that the two leading contenders for the Democratic Party nomination are a woman and an African-American is something historic in American politics. No one can doubt that. But is this relevant to the real issues? While Obama leads in the delegate count, Clinton seems to be doing all she can to drag him down through what is appearing to be almost a “smear-and-fear” campaign. Still, supposing for a moment that the Clinton-Obama stalemate will not negate what should be the Democrats' golden opportunity to retake the White House, let us ask how much of a difference would the election of either of them make? Would we see just tinkering around the edges where the oligarchs continue to rule while a slightly more compassionate government tries a little harder to ease the plight of the common man? Or would we see a fundamental difference that would move the nation back in the direction of its democratic roots? Would we see a transformation on the order, say, of Franklin D. Roosevelt's New Deal? Anything like Abraham Lincoln's determination to preserve government “by, of, and for the people”? Something similar to what was called the “Revolution of 1800,” when Thomas Jefferson took the government back from the Federalists who had compromised the ideals of 1776 by turning over so much power to the financiers who were working behind the scenes to control economic matters through Alexander Hamilton's First Bank of the United States? Or even an upheaval like the American Revolution itself where a new nation was created in the face of oppression by a London-based financial, economic, military, and political tyranny which today's oligarchs who work out of the gigantic banking conglomerates and Wall Street investment houses are coming to resemble more and more all the time? Anyone who runs for president and actually wishes to accomplish something must realize that under our constitutional system of government, the only individual who can bring about change is a strong president acting on behalf of “We the People.” The enemy of such a president would be the oligarchs, elitists, and “Robber Barons” who have subverted democracy repeatedly throughout American history but particularly over the past quarter century. Of course in recent years the oligarchs, acting as what President Martin Van Buren once called the Money Power, have become more deeply entrenched than ever before, with many layers and complexities added since the times of Jefferson, Lincoln, and Roosevelt. The problem today is exponentially worse as the power of the oligarchs touches every aspect of life. This has everything to do with the initiating of the Federal Reserve in 1913 which was the oligarchs' pathway to power. The waters today are far murkier than ever. The complexity mirrors and in large part is a result of the debt-based monetary system which the oligarchs not only run but own. So the big question is will any president be able to disentangle him/herself from the myriad of tentacles that have grown over the years and that have the effect of binding the president to the oligarchy's system. This system since 1913 has gained momentum and absolute power and credibility even in the face of its fatal design flaws. The next president will be defined by whether she or he is willing to bite the hand that has fed her/him by taking on the oligarchy and acting on behalf of the people. The two candidates who most emphatically would have done this—Ron Paul for the Republicans and Dennis Kucinich for the Democrats, both members of the House of Representatives, not the more elitist Senate—are out of the picture. Ralph Nader is back on the scene but is so late in arriving that his impact will likely be negligible. Of course we know where John McCain stands in making himself increasingly a clone of George W. Bush. Meanwhile, Hillary Clinton has seriously compromised herself by accepting donations from so many members of the financial oligarchy and corporate elite. Obama has been the more populist of the two in raising funds from over a million individual donors. Whether this is indicative of the likelihood that he would govern in a more independent fashion is far from clear. What is clear is that from this point on, the voters in the remaining Democratic primaries, as well as the super-delegates, should have only one question in mind. Not whether Clinton or Obama has the more persuasive slogans or slings the most mud or is the most “ready” to lead. Not the side-issue of whether history will be made by the election of a woman or an African-American. Instead we should be asking whether either will fight against the oligarchs on behalf of the people. Given the rush of events, 2008 should be a major turning point in American history. If three-fourths of the population believes the country is moving in the wrong direction, can we count on a new president genuinely to represent this majority? Or will we simply get another version of "more of the same"?